Fig. 1. Heifers fed olive oil bioactive extracts (OBE) at the NFREC Feed Efficiency Facility. Feed intake was measured daily using the GrowSafe feed intake monitoring system. Photo credit: Lautaro Rostoll. The fact that stress is detrimental to animal performance is a well-known concept in beef cattle production. The impact of stress on cattle is observed at various levels, and it can have multiple consequences, all of them ultimately affecting growth and performance. Stress is a very complex process to define and can take place in many different forms. During a stress event, the animals may experience an inflammatory process that ultimately leads to the overproduction of certain types of proteins called pro-inflammatory acute phase proteins. These proteins have a very important role in mounting the immune response needed to fight the stressor. Some are directly involved in recruiting immune cells to the inflammation site, others inhibit microbial growth, and all of them ultimately help in decreasing the negative impact on performance. However, the production of these proteins has a cost in terms of nutrient use efficiency, and these nutrients are diverted away from productive processes into fighting an inflammatory process. Cattle may experience stress due to excess heat, digestive upsets such as bloat and acidosis, transport, weaning, castration, and many other processes. Often, many of those processes occur almost concurrently in our typical beef production systems, creating an additional challenge that can lead to increased morbidity and decreased animal performance. The majority of the 800,000 beef calves that are born annually in Florida leave the state in a truck heading to a backgrounding, stocker, or feedlot facility, and in many cases the calves are weaned and trucked in the same day. For this reason, any opportunities to mitigate weaning and transport stress could have an impact on the post-weaning performance of Florida calves, potentially enhancing their economic value. In 2017, the University of Florida, North Florida Research and Education Center (NFREC) began a series of research projects aimed at investigating the potential of olive oil bioactive extracts as a potential feed additive to mitigate stress in cattle. The idea stems from a series of studies conducted in pigs and in rodents, in which certain compounds purified from the olive trees, including fruits, leaves and stems have shown anti-inflammatory and antioxidant properties. These compounds are part of one of the largest classes of plant natural products, known as pentacyclic triterpenes and they are isolated from pomace oil, which is the residue left after olive oil extrusion. In order to test the potential of these compounds as a novel feed additive for newly weaned beef calves, at NFREC we conducted a series of in vitro (in the laboratory) an in vivo (in the animal) studies. In this edition of the Panhandle Ag e-newsletter, we will share the results of the in vivo trials. A group of 36 newly weaned Angus crossbred heifers (463 lb of BW) from the NFREC herd were assigned to the study. The heifers were housed at the NFREC Feed Efficiency Facility and were fed a common backgrounding diet comprised of corn gluten feed (61%), cottonseed hulls (32%), molasses (4%) and a mineral premix (3%) containing, or not, the olive oil bioactive extracts (OBE) tested at either 0.04 or 0.16% of the diet DM (Figure 1). After 21 days receiving their respective dietary treatments, the heifers began a period of 12 days during which they were challenged every other day with an intravenous dose of a lipopolysaccharide (LPS), which is a common endotoxin produced in the rumen. When the LPS in the rumen translocate to the blood, it causes an inflammatory response that is characterized by a decreased feed intake and increase body temperature, among other responses. This model was used to simulate a subacute chronic inflammatory process, and then be able to test the potential of OBE in mitigating that inflammatory stress. To make sure that the model was successful in creating the inflammatory process, a group of heifers received the control diet and was not challenged with the LPS, receiving only a saline solution injection. Thus, the four treatments tested (9 heifers per treatment) were: 1) a negative control group not fed OBE and not challenged with LPS (CTLNve); 2) a positive control group, not fed OBE and challenged with LPS (CTLPve); 3) heifers fed OBE at 0.04% of the diet DM (OBE1); and 4) heifers fed OBE at 0.16% of the diet DM (OBE4). 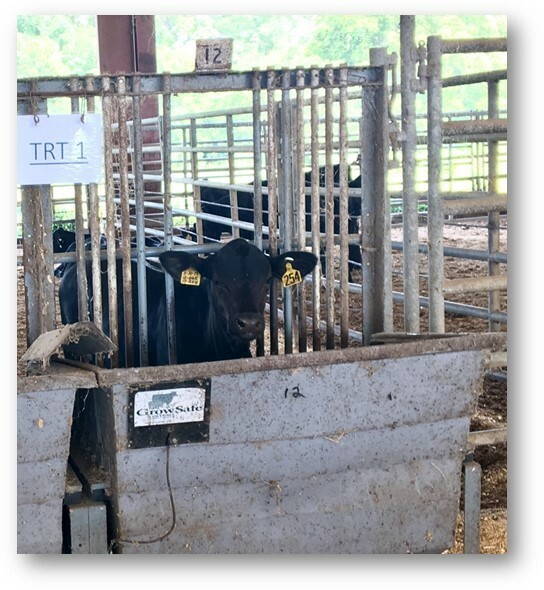 Heifers were bled every other day during the challenge to measure blood parameters indicative of an inflammatory process, and an intravaginal device was inserted to measure temperature continuously every 5 min for the 12 days of the LPS challenge. 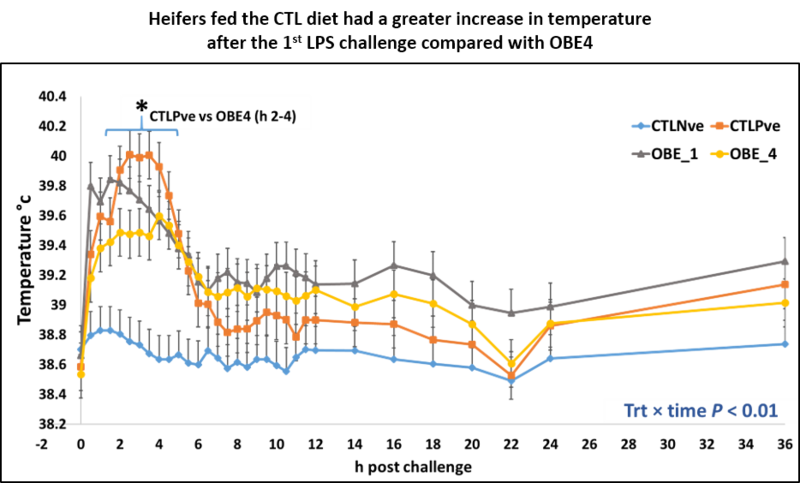 Results from the study show that feeding OBE, particularly at the greater inclusion level, had positive effects on vaginal temperature after the endotoxin challenge (Figure 2). 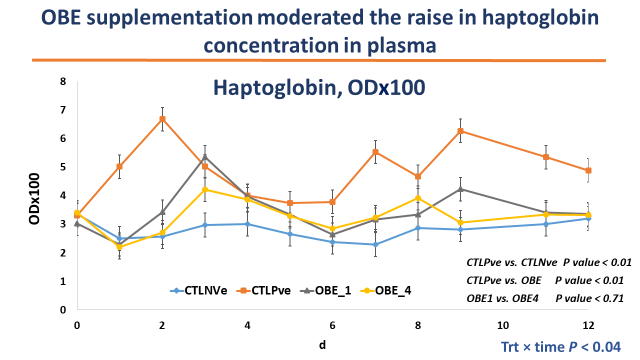 Additionally, the increase in the concentration of the acute phase protein haptoglobin in plasma following the endotoxin challenge was moderated in heifers fed OBE, showing a positive effect on decreasing the acute phase response (Figure 3). This was also evidenced by an increase in dry matter intake in heifers fed OBE when compared to control. Several other measurements such as liver biopsies, and many other blood parameters were conducted in this experiment to fully understand the mode of action of these bioactive extracts and are currently being analyzed. These preliminary results are very promising and are consistent with the findings in mice and pig models receiving these types of novel feed additives. Figure 2. Effect of feeding olive oil bioactive extracts (OBE) on vaginal temperature in heifers challenged intravenously with LPS (endotoxin). Figure 3. Effect of olive oil bioactive extracts (OBE) feeding on blood concentrations of the acute phase protein haptoglobin. A decrease in the concentration of this protein shows a positive effect of the supplement on moderating the acute phase response. This first study shows promising results in terms of the potential of olive oil bioactive extracts as a potential novel feed additive to enhance productivity in newly weaned cattle. A reduction in the acute phase response was observed in heifers fed OBE for 21 days prior to an endotoxin challenge. This was consistent with an increase in dry matter intake and with improvements in several blood parameters indicative of a potentially enhanced immune status. Feeding olive oil bioactive extracts may provide an opportunity to enhance the value of Florida calves, by including them in a preconditioning program post-weaning, or prior to shipping to improve subsequent animal performance.